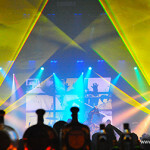 The 2009 Diesel:U:Music live performance on July 30th, 2009 at NYC’s Webster Hall featured two Lightwave lasers beaming specific event-matching yellow & bright fuchsia colors. The 2009 Diesel:U:Music world tour stop in NYC featured bands HEARTSREVOLUTION and The Terror Pigeon Dance Revolt! 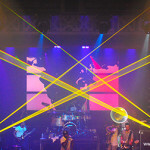 The bands performed live alongside an all-star line-up: Theophilus London; Passion Pit; Cobra Starship; hip-hop’s newest all star Drake; and Grammy® winning The Roots with a special guest collaboration featuring Clipse & Kanye West. 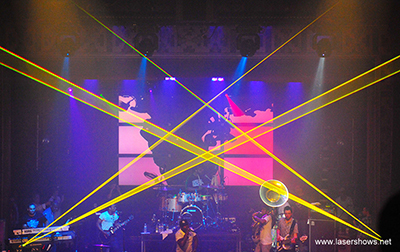 The tour required our lasers to project in two very specific colors; the yellow and pink variants that are the official colors of the tour. 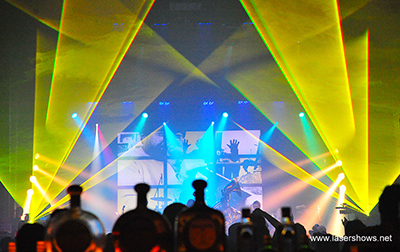 This was executed flawlessly and ensured the lasers were not only a spectacular addition to the live performance, but representative of the overall event.